To have the desire to work from home and the mental ability to work from home aren’t the same. Not everyone can succeed at it and usually the reason for this is not realizing the importance of self management of your work. Often, when people who have worked in an office start working from home, it soon begins to feel like a holiday, indiscipline creeps in, distractions affect work. Visits from family members, friends, neighbors, TV, phone, social media, are just a few of the distractions. Soon, it can become a challenge to focus on work, meet deadlines, adhere to quality benchmarks, etc. This is among the most common reasons why some fail at working from home. 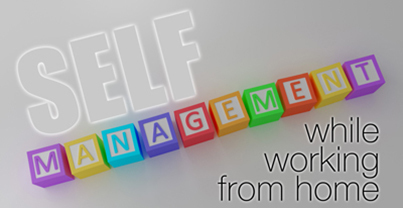 Learning some self management skills can help you succeed. Here are a few tips that can help you self manage your work, and prepare you for success while working from home. The flexibility of working from home can result in erratic timings. It’s important to develop a daily work calendar, keep specific work hours and stick to it. Beginning and ending your work day at a particular time everyday can be very helpful in setting a discipline. This will also help you meet most of your deadlines and accomplish more than what you would have when working at all times. While it is important that you are disciplined while working from home, it is equally necessary that you take regular breaks from work. Working continuously without breaks will leave you feeling jaded. One of the benefits of working from home for many is the freedom to do other things that you would not be able to complete if you had to commute to an office. You can work them into some of your planned breaks where possible. If your work at home is desk-bound, then these breaks should also be used to move around and get some exercise if possible. This will ensure that being at a desk all day doesn’t adversely affect your health. When you work from home, it’s important to designate a space from where you work. Working from home isn’t the same as working from “anywhere in the house”. Keeping your home office setting separate from the personal and family space can be helpful in minimizing distractions too. Keep your desk and the space around it free of clutter and possible distractions. An office setting with colleagues around you can act as a constant reminder of things that need to be accomplished in a day. While working from home this is often absent. Coupled with domestic distractions, it’s easy to forget things and miss tasks. Creating a to-do list can help you to remember and prioritize most of your tasks for the day, week, or month. Strike off things from your to-do list as you complete them. This has a psychological impact. At the end of the day, when most or all tasks are struck out, it will give a feeling of productivity and accomplishment. Easy access to food at home is a common distraction for many. Munching at the job or frequent trips to the kitchen to get something to eat can impact your work. Studies have shown that continuous eating or eating the wrong kind of food can affect your creativity and productivity as well. Limit the eating during break time only. Overworking ?? and letting the work spill into personal time is also a common problem. It is necessary to set your boundaries in terms of work timings or the amount of work you will do in a day. As much as it is important to respect the time that you give to your work, it is equally important that you respect the time that you have kept for yourself. If you work from home only on particular days, it is important that you treat these days like normal work days that you would have spent at an office. If required, keep reminding yourself that not everyone is given this opportunity to work from home. Stick to your schedules and deadlines. Not doing so can result in your work spilling over to the next day and disrupting you, your employer’s as well as your client’s schedules. Not interacting with people face to face as you would in an office can cause communication to breakdown. Remember that your employer/client will not know what is going on with you until you inform them. Proactive communication and information flow will also mitigate the feeling of working in isolation and being cut off from colleagues. When you have developed these habits, you would be well on your way to managing your work efficiently. Some individuals are naturally able to self manage, while others need to develop these skills. If you have these qualities and are looking for professional opportunities to work from home, check out our employment section and current job openings. We would be happy to hear from you and this could be the start of a long and rewarding career working from the comfort of your home office.